Hello, blogger today I want to discuss with you an important probably the most important factor for all the successful blogs and that is how to write quality content. I have already said in my several articles about content and how important the content is for your blog. I think you must realize the importance of content. Contents represent you and your blog. By reading your content readers can understand that how smart and knowledgeable you are? If you are a blogger and want to be a successful blogger you must know how to write quality content. If you see a successful blogger and his/her blog, you will see that his/her blog contain a lot of quality contents. Contents make him popular among the readers. High-quality contents inspire the readers to come back your site again and again. Generally, the newbie bloggers make a mistake, I also did so that is thinking about quantity, not quality. They think that the more contents they have the more visitors they will get. But that is not true without top class content you will not reach the door of your readers. Think positive about your readers and make them regular visitors by your great contents. You can easily rank your blog in search engines if you know how to write quality content because search engines like the high-quality contents. If you are worried about how to write quality content, my article is for you. I have learned from my mistakes and I am going to write this article from my experience. Here I show you how to write quality content for your blog. When you want to write a content, you must select a topic. When you select a topic you should remind about your niche and always select such a topic which is related to your niche. You should not neglect your niche because successful bloggers are serious about their niche, they never ignore their niche. If you want to write quality content, you should know how to select an excellent topic. If you can select a perfect topic and you have a clear idea about this topic, you will able to write a quality content. All the webmasters, article writers, and successful bloggers know how important the keyword research is? It is one of the most important parts of SEO. Many bloggers ask me how to write quality content but they don't know how to select perfect keywords for their contents. You must do some keywords research before writing a content. I recommend to select long tail keywords . Keywords research helps you to write a quality content so that you can rank your content easily in search engines. There are a lot of keywords research tools and by using these tools you can select perfect keywords. Most of the newbie bloggers don't know how to write quality content and generally they make some mistakes for want of basic knowledge. One of the worst mistakes for the blogger is publishing duplicate and copied content in their blog. Some bloggers try to make their blog popular without doing hard work but that not possible. Blogger should know how to write quality content and how to serve the visitors with original content. You must depend on yourself, you should not act like a thief, you should be perfect and write what you know. Headlines or titles are really important for a quality content. You should select attractive titles to attract the readers or visitors to your blog. Because most of the visitors only read your titles and if you can attract them by your titles, they will read your full content. Make your titles or headlines so attractive so that readers can understand how important your content is! You should not copy other titles or headlines. It is really bad in the eye of google. So be smart about your titles if you want to know how to write quality content. We are too much careful about search engines when we write content. But we should remind we write content for our readers, we want to serve the visitors by our contents. So we should write user-friendly content. You must think about search engine rules because it is really important. When you write you must think about your readers, you should write such content that you are talking with them about their problems. You have to know how to satisfy your readers if you want to know how to write quality content. You must follow search engines conditions when you write but you should not ignore your readers' value. It is really a good idea to use images or videos in your content. You can not use videos in your every content but you should use images in your every content. Because images make your content more attractive and if you can use perfect images, visitors easily understand what you have said? Using images in content is preferred by the search engines and if you can use SEO optimized images, you will get more traffic by your images. You should not use other images in your content, it is not a good idea because google doesn't like this habit. You can also add videos which are related to your content. Many bloggers want to know how to write quality content but they have no basic knowledge about SEO. You must have a clear idea about SEO specially on page SEO if you want to write quality content. You should publish SEO optimized content so that you can easily reach the doors of visitors. When you write an article you should remind about on page SEO. On page SEO let the search engines know what is your article about? It helps you to rank your article in SERPs. 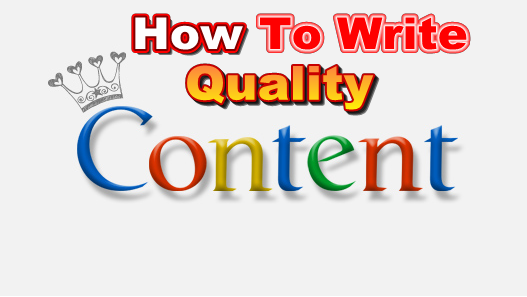 Here I have told you how to write quality content fo your blog. Contents make you famous if you can make them awesome. You don't need to be a scholar to know how to write quality content, but you need a clear idea about the above factors. Make your content great to be an awesome blogger.